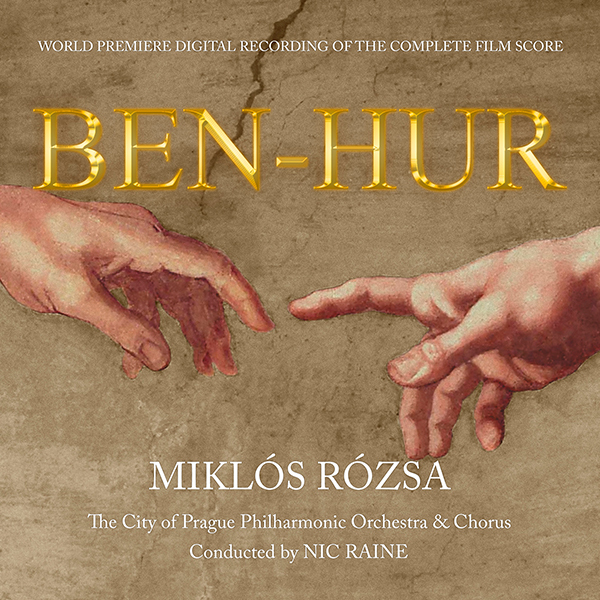 Tadlow Music is proud to announce the release of the classic film music event of the decade – a special collector’s edition 2-CD set of one of the greatest film scores of all time – Ben-Hur composed by Miklós Rózsa. The complete 157-minute score, including previously unreleased music, has been re-recorded in stunning and dynamic 24-Bit 96kHz digital sound, performed by the award-winning City of Prague Philharmonic, conducted by Nic Raine and produced by label founder James Fitzpatrick. Much has been said through the years of the, then record-breaking, 11-time Academy Award winning film Ben-Hur, initially a remake of a very successful silent film from 1925. After his boyhood friend Messala's fanatic loyalty to Rome makes him a powerful enemy, Judah Ben-Hur (Charlton Heston) is found guilty of an attempted murder he did not commit. His family is banished and he is enslaved on a warship. Through his ferocity in a raging sea battle, he is able to escape and become a horse trainer. To exact his revenge, Ben-Hur decides to compete against Messala in the Roman chariot races. They race, locked in a battle to the death. Barely surviving, Ben-Hur forsakes the sword for Christ and finally finds redemption. MGM assigned the composing task to Rózsa, who they had under an exclusive contract, customary practice at the time. Since he had previously composed music for the studio’s epics Quo Vadis and Julius Caesar, Rózsa seemed the perfect choice for this William Wyler-directed epic. He worked on the film for well over a year, traveling back and forth to the set in Rome from Rapallo (Italy) where he was working on other non-film commissions. Upon the film’s release it and Rósza’s score became almost instant classics. This premiere recording features Rózsa’s score in the most complete form to-date. The music is presented as heard in the film, but without the edits to the music, which were required for the picture. Tadlow Music has become one of the preeminent record labels producing and releasing newly reconstructed versions of classic film music, including Rózsa’s El Cid, Sodom and Gomorrah, Quo Vadis and The Thief of Bagdad. The reconstruction of the music started with the original version of the sheet music registered by MGM with the Library of Congress. Reconstructionist and Rózsa expert Leigh Phillips combed through these ‘sketch scores’ – the hand-written music Rózsa would have provided to his orchestrator. He looked at the copious notes written on its pages, and began to both interpret the notes and condense them into new, computer-generated sheet music for the musicians to play. In addition to the cues recorded for the film, Phillips included music which was written for deleted scenes as well as pieces composed, but ultimately not used in the final version of the film. Guided by Rózsa’s sketches, he orchestrated the music for what would ultimately be 96-piece orchestra and an 80-voice choir, with additional ethnic instruments. The recording dates were divided into two periods, four days in January and four in April of 2017. Well-versed in recording Rózsa’s music through the years, Tadlow Music founder and this albums producer James Fitzpatrick turned to one of Europe’s most outstanding and virtuoso orchestras, the City of Prague Philharmonic and Choir, under the direction of Nic Raine (who actually orchestrated for Miklos Rozsa on some of his later film scores) for this very special recording.